The MXC-45D’s unique design allows repeatable electrode replacement with a simple but accurate rotating clamp. The top clamp of the MXC-45D is designed to be compatible with Axon CV200B, CV-7A, and HEKA EPC-10 headstages. The rotating portion is configured such that the probe /pipette rotates up and away from the experiment at a 45° angle through a full 180°. The repeatable stop returns to its location with micron level accuracy and the stop’s orientation can be changed simply by loosening a single 1⁄4-20 cap screw. The MXC-45’s unique design allows repeatable electrode replacement with a simple but accurate rotating clamp. 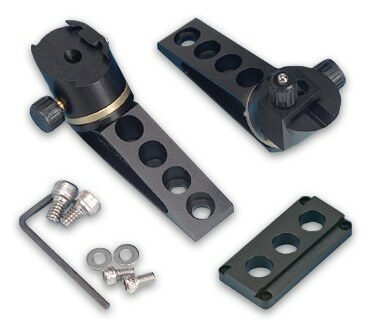 The top clamp of the MXC-45 is designed to be compatible with headstage mounting rods from 3- to 10-mm in diameter. The rotating portion is configured such that the probe /pipette rotates up and away from the experiment at a 45° angle through a full 180°. The repeatable stop returns to its location with micron level accuracy and the stop’s orientation can be changed simply by loosening a single 1⁄4-20 cap screw.